Ross is one of my favorite stores. They carry clothing, shoes, handbags, small furniture and other household items. They also carry food, but I don’t usually buy foodstuffs when I’m there. 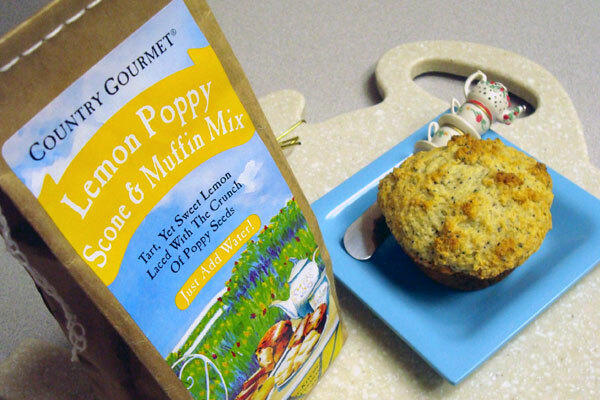 Tonight, though, while looking for a gift for a colleague, I stumbled on a Lemon Poppy Scone & Muffin Mix with no preservatives or artificial flavors. The ingredients looked good; the calories were reasonable; each serving offered a decent amount of fiber and was low sodium. The package called for one up of water, but I decided to go with unsweetened vanilla almond milk. I enjoyed my warm muffin with a spritz or two of I Can’t Believe It’s Not Butter spray. Delish! Sometimes simple – and pre-packaged – is really quite good. Preheat oven to 400 degrees and mist a muffin pan with non-stick spray. Place mix in bowl, add almond milk and stir until just blended. Bake 18-20 minutes or until golden. Entry filed under: clean eating, food review, recipes. Tags: quick and easy muffins.